Student Kendra Gordon tells Fox News she was in a classroom next to on where the gunman was shooting. 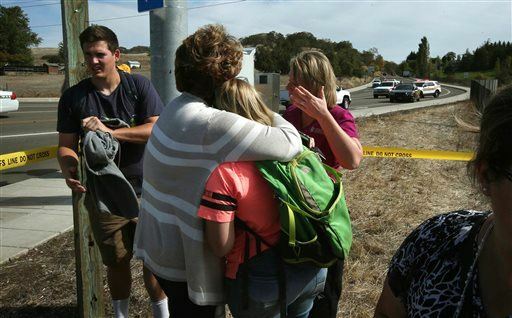 “I was sitting in class when we had first heard the shot. And we didn’t think it was a gunshot, we thought it was a firecracker. And then we heard another one,” she said. “And so, one of the students in my class, she went out and checked it. She got shot twice, one in the arm, and in the stomach. And she came back and told us to lock the door, shut the lights off. And we sat there for 20 minutes waiting for police to show up. It felt like forever.” Gordon said she’s not sure how the student who was shot is doing now, Reuters reports. Student Kortney Moore says a bullet came through the window of her writing class in Snyder Hall; she saw her teacher shot in the head. The shooter came inside the room and told people to get on the ground, she tells the local News-Review. She says he then asked people to stand up and say their religion before he started firing. Multiple witnesses tell the local Register-Guard that only one classroom, a writing and speech class in Snyder Hall, was targeted.